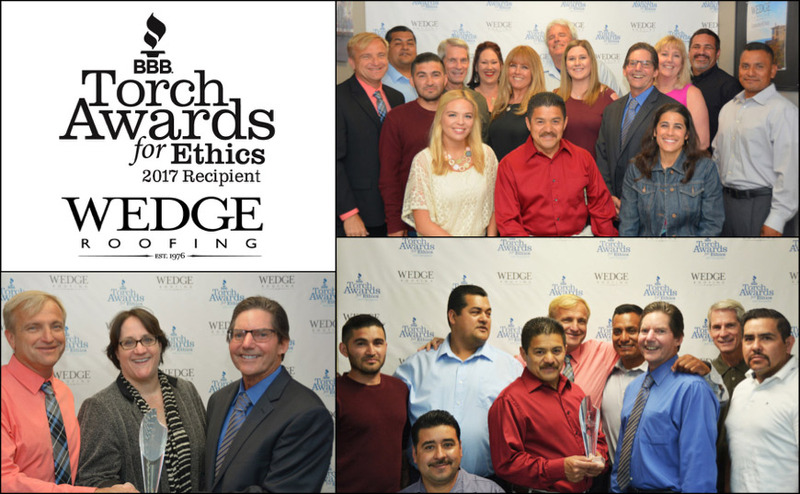 The Better Business Bureau (BBB) of the San Francisco Bay Area and Northern Coastal California has awarded Wedge Roofing with the 2017 BBB Torch Award for Ethics in recognition of the company’s ethical and trustworthy roofing services, as well as their commitment to supporting their community. The BBB A+ Rated roofing company serving Marin County, Sonoma County, San Francisco and Napa since 1976 received the prestigious ethics award in the category of 11-49 employees, and is now nominated for the BBB International Torch Award for Ethics. The Torch Awards for Ethics competition was created to honor businesses that demonstrate their commitment to trust and marketplace ethics, and the award embodies BBB’s mission to be the leader in advancing marketplace trust. In this rigorous regional competition, businesses from thirteen counties in the Bay Area and Northern California completed a meticulous application process to illustrate their commitment to ethics and community leadership. The independent panel of judges comprised of highly distinguished San Francisco Bay Area business and community leaders awarded Wedge Roofing a score of 53.4 out of a possible total score of 60 points. The Better Business Bureau team, California State, and local Bay Area dignitaries attended the award ceremony held at Wedge Roofing’s Petaluma headquarters. Attending the award ceremony on behalf of California Assembly Member Marc Levine were District Director Cal Weeks (left) and Senior District Director Melissa Apuya (pictured with Gary Harvey and Ralph Wedge in left image) who presented Wedge Roofing with the California Legislature Certificate of Recognition. Representing the city of Petaluma, honorable guests included Petaluma Chamber of Commerce President Onita Pellegrini and Petaluma Mayor David Glass (pictured with Gary Harvey and Ralph Wedge in middle image); Bank of Marin Branch Manager Kathy Madsen and Rebuilding Together Petaluma Executive Director Jane Hamilton (pictured with Gary Harvey and Ralph Wedge in right image). Wedge Roofing was selected to receive the BBB 2017 Torch Award for Ethics by an independent panel of judges including: Steve Van Dorn, President & CEO of the Pleasant Hill Chamber of Commerce; Alan Ross, Professor of Business and Public Policy at UC Berkeley Haas School of Business; Jim Ruane, Mayor of the City of San Bruno; Lan Wu, Ph.D., Associate Professor of Marketing at the College of Business and Economics of CSU East Bay; Frank Davi, Senior Director of Canyon Design Build; Alex Alexander, West Point and Harvard Business School graduate and author of The Entrepreneur’s Edge; and Reverend Dr. David Moore, pastor at Trinity Lutheran Church in Walnut Creek.